Weaving, and especially tablet weaving, is something that really interests me. This page will hopefully be a place of inspiration as well as a place of information for you. 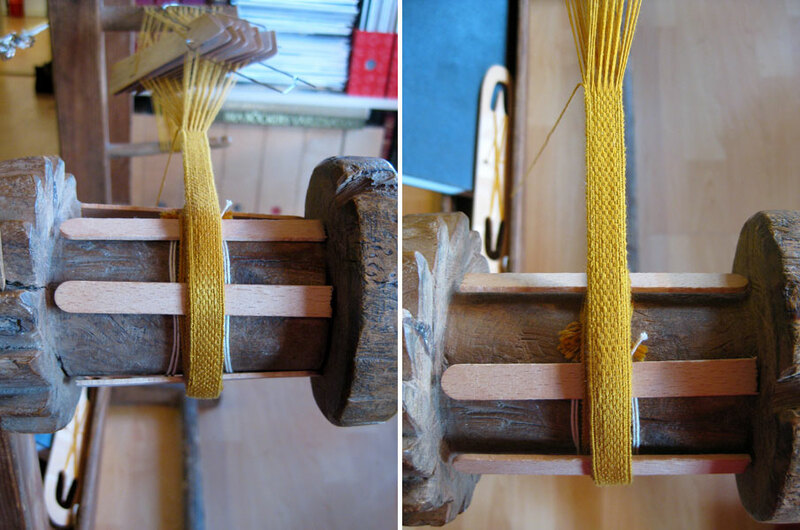 Guntram’s Tabletweaving Page – Guntam has a website with lots of pictures and patterns for weaving. He has even made the GTT (Guntrams Tabletweaving Thingy), an application for making patterns. Phiala’s String Page – choose Tablet Weaving in the left column and find handouts and the theory behind the Snartemo pattern among other things. I’ve made more garters for the Order of the Golden Ribbon. This time using MOL no 451 as inspiration. The main differences form the original ribbon are the width and the colours. I needed my garters to fit my buckles so added six tablets making the ribbon 14 mm wide and since it was intended for the Order of the Golden Ribbon I used two shades of yellow for the silk thread. Documentation: Striped silk garters for the Order of the Golden Ribbon. Silk tablet-woven braid based on a 14th century braid from London. Textiles and Clothing, 1150 – 1450 by Crowfoot et al has an example of a tablet weaving strap dated to the first half of the 14th century (fig 100 on page 133). The band is monochrome with an effect that looks a bit like twill. The strap is threaded with 12 tablets. 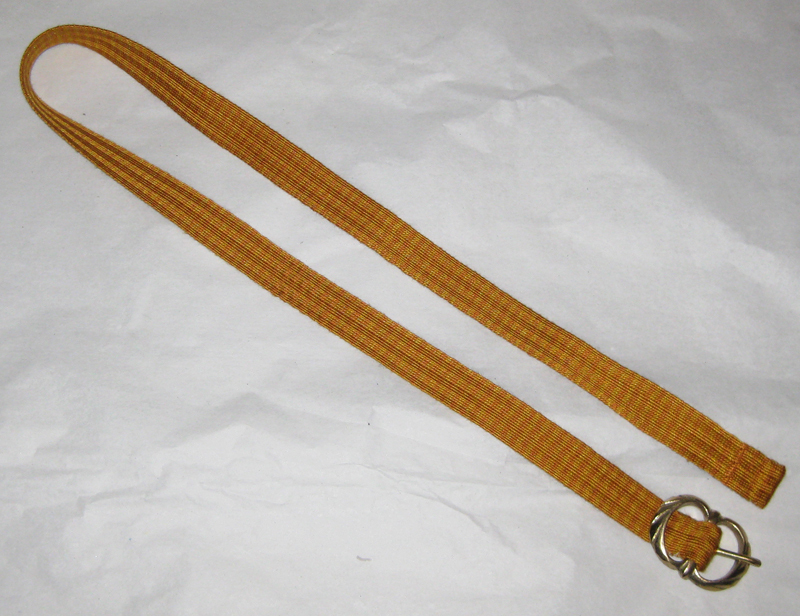 I’ve used yellow Shappe silk 120/8 and the width of the strap is 10 mm. The original braid is made out of silk and is probably monochrome with a width of 8 mm. It was probably used as either a girdle or as spur leather. I plan to use mine as a decorative garter and a symbol for the Order of the Golden Ribbon which is an award for service in Nordmark.